Oh my goodness, so many fun updates going on today. First of all, big congratulations go to Pam, the lucky winner of the ticket giveaway for the Lights! Camera! Fashion! fashion show this Sunday at South Park Mall. I hope I get a chance to meet you! I will email you and put you in contact with the sweet gals from the Junior League of Charlotte who are organizing this. Secondly, I was so excited for a great lunch yesterday with Melissa from Simply Sweet Melissa and can you say kindred souls? She and I just clicked on every account and had the best time. The lunch hour (HOURS) flew by, whoopsie daisies! We will be making this a repeat event for sure. I'd love to get together with our guys sometime as well. And lastly, I am so excited for a Charlotte blogger meet-up next Thursday night! Details are all out on the Charlotte Social Facebook page, but let me know if you want me to forward you an email with details! We will be making jewelry and sippin' on some fun adult beverages :) I hope to see a lot of familiar faces and meet some more bloggers! April :) You sweet thing you! 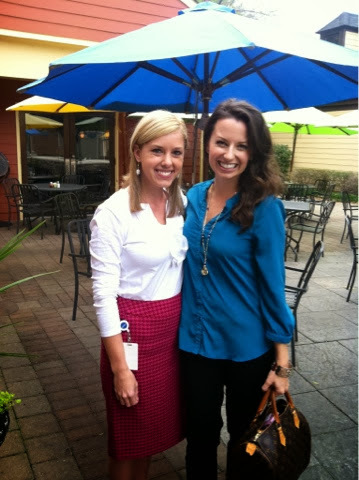 I had the best time and can't wait to see you (again) next week at the Charlotte Social event! And a double date in the NEAR future is a must. xoxo! yall have the MOST fun blogger meet-ups...I am SO jealous and wish I could come join the fun!!! Next Thursday seems to be the day everyone needs to schedule a meeting. Bummer. I met Melissa briefly at Caitlin's Lilly part and she was absolutely adorable. How cool that you guys were able to get together for lunch! Bummer, I will be out of town but I hope you have a blast. Cute photo! I look forward to seeing your recap of the event from the SouthPark Belk.